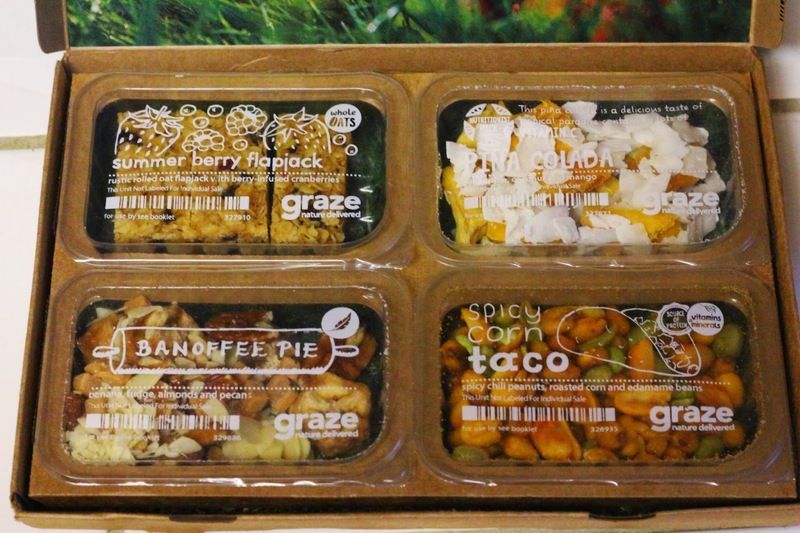 I found a free code for Graze so I thought I'd try out their snack box service. They send you 4 prepackaged snacks for snacking throughout the day. I love the size and portability of their snacks because you can throw them in a purse or bag and always have a delicious snack on hand for between meals. Summer Berry Flapjack - These are like little granola bars, only chewier. I really liked these and I hope I receive more Flapjack packs in the future. I gave this one a "Like" rating. Pina Colada - Let me begin what I'm about to say about this one with, I am very particular about my dried mangoes. I have to have dried mangoes from the Philippines. If you've ever tried dried mangoes from the Philippines you probably know what I mean. They are worlds better than dried mangoes from Thailand. I urge you to go to your local grocery or bulk store and try dried Phillippines mangoes if you haven't, even if you think you don't like dried mangoes. They are coated with what I'm sure is crack, and they are amazing. The dried mangoes in this pack are not good dried mangoes. They weren't chewy at all and I just didn't care for them. So, this pack was just not for me. I even like coconut! But, after having superior dried mangoes, I just can't go back. I may have to "trash" all dried mango packs. I gave this one a "Trash" rating. Banoffee Pie - I was very excited for this one, because I've heard such good things about actual Banoffee Pie, which I haven't tried before. But, this one was just ok, I didn't really care for the dried bananas which had little to no flavor. And trying to scoop out the slivered almonds was next to impossible. It would have been a little better with whole or even halved almonds. And the fudge just stuck to my teeth and didn't taste that great either. I gave this one a "Trash" rating. Spicy Corn Taco - This was the real winner of the whole box, I shared it with some friends and we all agreed it tasted like fancier corn nuts with better flavor. I definitely hope this one is in another Graze box of mine. I gave this one a "Love" rating. You can get a nibblebox with any of their snacks, or the lightbox only contains snacks 50-150 calories each. You can also change how frequently you want to receive the box, from every 2 weeks or once a month. Make sure if you have any food aversions or allergies, you can group their snacks by that ingredient and "trash" all of them by that ingredient. But be careful, they're all made in the same area so if you're especially sensitive to nuts for example, you may want to skip this subscription. If you want to try Graze for free, here's a link to a free code. They'll give you the first box free, and you can cancel after that if you'd like, or if you stick with it you'll also get the 5th box for free as well.